Sebastien Buemi is set to miss out the next of the FIA Formula E New York Championship due to commitments in World Endurance Championship. The Renault e.Dams team confirmed that the Formula E reigning champion leader will miss New York ePrix double-header because of duties with Toyota in the FIA WEC. The Swiss driver is a title contender in both series. 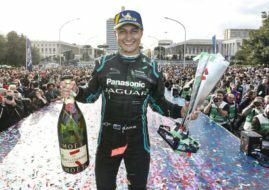 He heads the standings in the Formula E while in the WEC Buemi currently holds the 2nd position. The French team investigated the possibility of Buemi taking part in first New York ePrix before then flying to Germany to take part in the Nurburgring WEC race but that possibility became unrealistic after Toyota strongly held the position of not allowing Swiss driver to go. The Renault e.Dams team is not happy with the situation and had to react quickly. That’s why Pierre Gasly has been confirmed as a replacement. Gasly, who is 2016 GP2 Series champion, currently competes in the Japanese Super Formula, and will have very limited time to settle with the new car.